Some women love bags because it is durable, fashion and classic. That's the case with this faux Leather Tote. This bag can hold just about anything you want to take with you on- the-go. The tote has one main compartment that can be closed with a zipper. Inside there's a smaller zippered compartment as well as two smaller open compartments. The padded interior features a separate interior space to hold your laptop without unnecessary bulk. This is the perfect toe for the everyday woman. This messenger bag is suitable for any occasion. This can really help you step up your fashion game. With an adjustable should strap, this bag is for everyone. 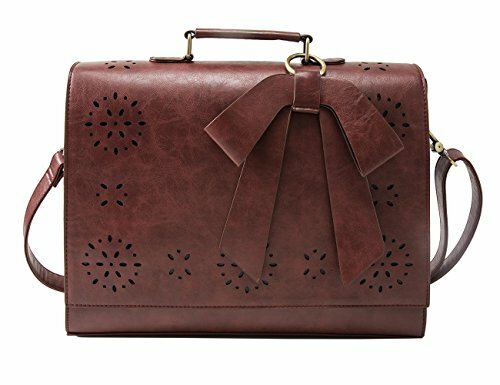 Well crafted and high quality pu (faux) leather handbag. It is an ideal gift for your friend, family and lover. It makes you more confident, gorgeous and unusual, easy to match for your daily clothes. Perfect choice for office workers and student, also can be used in the daily travel. An adjustable long strap which could be used as a purse, cross body handbag, messenger bag, school bag ect. Our brand are focus on high quality and retro style bag, our sole aim is to produce quality, genuine bag at an affordable price and make our customer satisfaction.